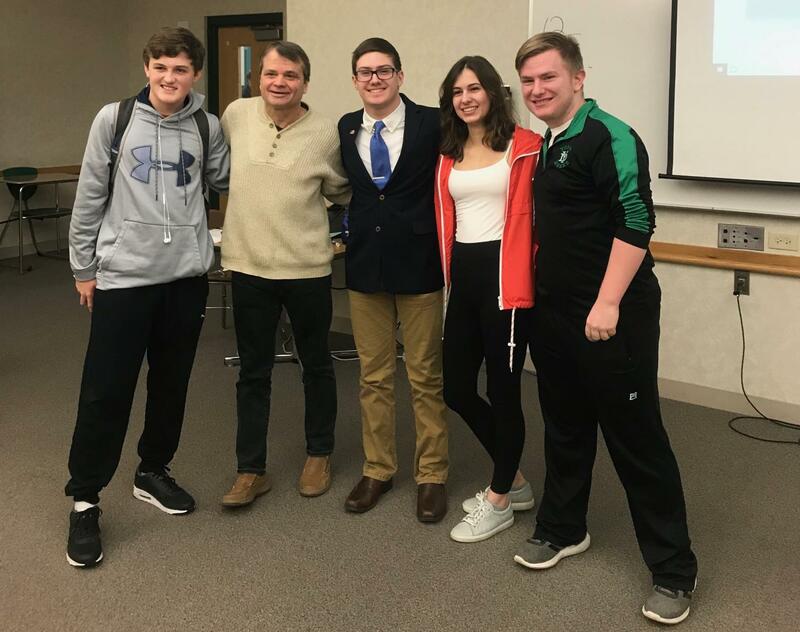 Congressman Quigley (second to the right) stands with juniors (left to right) Ryan Lynch, Ethan Thomas, Maya Wdlo, and Ronan Doyle. On Friday, Jan. 18, York hosted Congressman Mike Quigley to talk with US history classes. Quigley, a Democrat, is the representative for the fifth district of Illinois and has served in Congress since 2009 after winning a special election to replace Rahm Emanuel who left Congress to serve as President Obama’s Chief of Staff. He currently serves on both the House Appropriations and Intelligence Committees, two of the highest ranking in Congress. Congressman Quigley has traveled to York to speak with US history students for the past few years, and in fact, brought history teacher Patty Iverson to be his guest at the 2015 State of the Union Address. He began his discussion by talking about the negative connotations of politics, asking students why people choose not to pursue political careers. Students mentioned corruption, lack of privacy, and apathy towards menial topics as reasons for not going into politics. He went on to talk about the responsibility he felt to run for office following Emanuel’s move to Chief of Staff. But he focused the majority of his time on the issues facing the nation, and his own stake in those issues. He began by talking a little bit about the investigation into whether the Trump Campaign colluded with Russian agents during the 2016 election. At the start of the discussion, he wrote the word “suborn” on the board. The report was an article by Buzzfeed News claiming that President Trump attempted to bribe Cohen to lie to Congress about his dealings within the Trump Campaign. The story was published on Jan. 18, and was dismissed by the office of the Special Council investigating the matter. After the brief talk of the Russia investigation, he opened up to questions. He faced questions on a range of topics from the government shutdown to his views on specific issues such as the second amendment. During his time talking about the government shutdown, he explained the legislation that House Democrats have been passing since taking over the House. So far, the other six bills have failed to get a vote in the Senate, but just this week, Senate Majority Leader Mitch McConnell (R-KY) added those bills to the calendar following pressure from Democratic colleagues like Quigley. As for Congressman Quigley, he will go back to Washington as Congress and the President continue to debate the government shutdown.